His best known work, Hindle Wakes was, for time it was written in 1910, a controversial portrayal of Lancashire life which examined the fallout from a young working-class mill girl’s fling with the mill owner’s son. 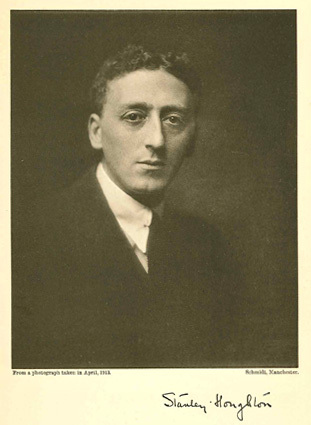 Harold Brighouse wrote an introduction to “The Works of Stanley Houghton” (Volume I by Constable, 1914) which serves as a useful mini biography – I have reproduced this as a PDF document (12 MB). I have found the marriage of John Hartley HOUGHTON to Lucy Mary DARBYSHIRE in 1880; John’s father is W. C. HOUGHTON, merchant and Mary’s father is Samuel DARBYSHIRE, no profession given. William Chadwick HOUGHTON died in 1887 at Ashton Grange and probate was proved by his sons George HOUGHTON (packing case maker) of Ashton Grange and John Hartley HOUGHTON (grey cloth agent) of Heath Side Knutsford. His personal estate amounted to £469 9s. In 1914, the effects of William Stanley HOUGHTON of 2 Athol Road, Alexandra Park, Manchester, which amounted to £5488 14s 6d, were left to his father John Hartley HOUGHTON (merchant) and Thomas Henry BATTERSBY (merchant). Following his death in 1923, John Hartley HOUGHTON’s effect of £11,459 8s 10d were left to Thomas Henry BATTERSBY. There is a record of the baptism of William Chadwick HOUGHTON in 1928. He was the son of George and Sarah HOUGHTON of Cheadle (England, Select Cheshire Bishop’s Transcripts, 1598-1900: FHL Film Number: 1655428). The GRO England and Wales marriages transcriptions for 1852 have a William Chadwick HOUGHTON and on the same page is an Alice HARTLEY (Oct-Dec 1852, Manchester, Vol. 8D, Page 771). The death of Alice HOUGHTON, wife of William Chadwick HOUGHTON, was announced in the Manchester Courier and Lancashire General Advertiser on 26 June 1886; she died on the 24th of the month aged 54. 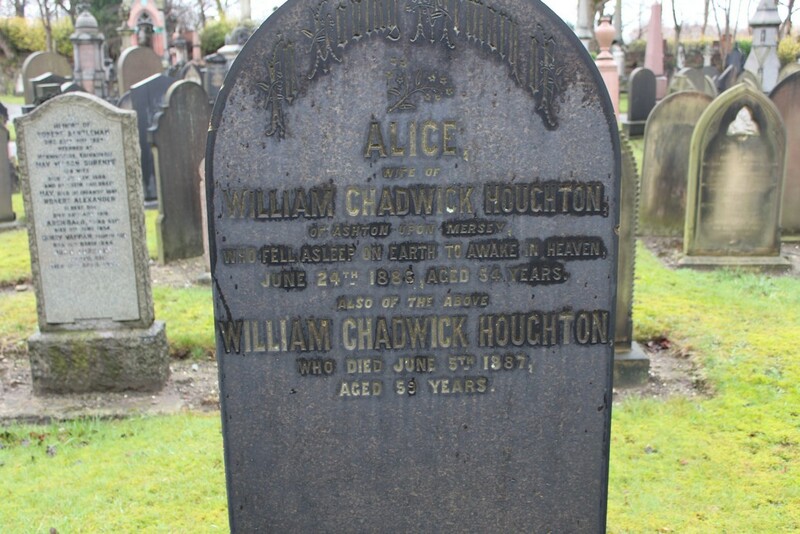 The Gravestones Photographic Resource website has the transcription and two photographs of the headstone of William Chadwick HOUGHTON and his wife Alice; they were buried in Brookland cemetery in Sale, Cheshire. One of the photographs is reproduced below (please note that copyright belongs to the original photographer – the photograph may not be used for commercial purposes).